Earn up to 19,960 reward points. Sturdy all-metal housing for your rack-mounted gear. 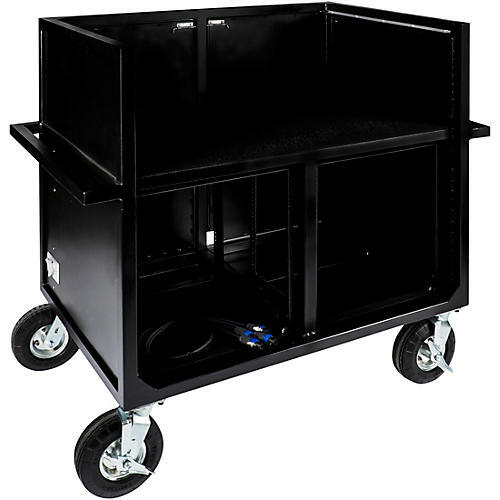 Titan Field Frames are designed to be the strongest, most stable, most durable percussion frames, racks and carts available. Each frame is made by hand to exacting standards. Every design feature is the result of input from real band directors who are on the road to games, competitions and exhibitions. Your input makes every Titan Field Frame precisely the gear you need, and it is built to last. These frames are made of steel – no wood, no aluminum. They come standard with no-flat, puncture-proof, industrial grade casters. Every weld, joint and edge is ground smooth to protect your kids and your instruments. Titan Field Frames’ range of electronic frames are designed to house and protect all of your amplification and pro audio equipment. The double rack frame offers extensive features and benefits all in two 12 U racks. The Double Electronics Frame also comes standard prewired with four USB outlets and 10 surge-protected outlets. There's also a multifunction carpeted performance shelf that can accommodate a mixing desk, synthesizer, or laptops, and the carpeted surface not only protects but also enables gear to be secured with Velcro to eliminate sliding during transportation.